Have you seen all those recipes for protein pancakes? They can be great if you appreciate them for what they are and don’t try to compare them to say… IHOP fluffy pancakes. Those they are not. It’s kinda like a veggie burger is awesome unless you’re attempting to tell yourself that you’re eating a real hamburger. Yeah, no. Just no. Protein waffles however tend to be a different story. Waffles aren’t meant to be fluffy pillows of airy goodness. Waffles are the pancake’s firmer and crisper cousin. They can stand a little full bodied texture. 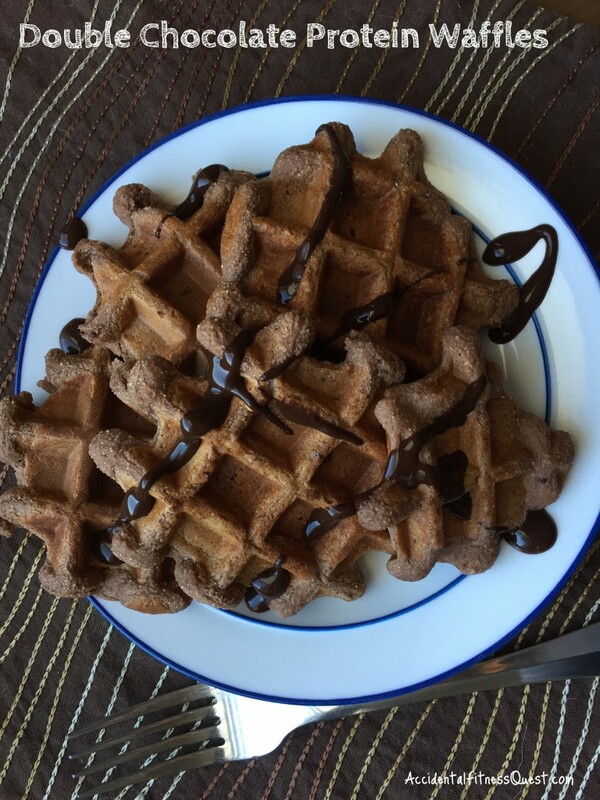 Combine protein waffles with not just chocolate but double chocolate and you’ve got a winner. Before you waffle, I’ve got plenty of other double chocolate options for breakfast like double chocolate banana bread, Lenny & Larry copycat double chocolate cookies, and double chocolate baked donuts. Preheat your waffle iron and mix all the ingredients in a small bowl. Depending on your protein powder, you may need to add a splash more water to get the waffle batter consistency. Bake in your waffle iron according to directions. Drizzle with the chocolate syrup. Makes approximately 4-5 waffles depending on the size of your iron at approximately 285 calories for the entire batch – 31g protein, 20g carbs and 9g fat. The recipe is easily customized by using different protein powders and flavors. I’ve even used vegan protein powder with great results. To make this completely vegan, you can sub in a flax egg for the egg (1 Tbsp ground flax with 2 Tbsp water). They also freeze well if you managed to save any. Reheat them in the toaster and eat them on the run. Double chocolate waffles and other fun foods can be a part of any eating plan whether you’re trying to lose weight or just better your health. No foods should be considered off limits if you love them. My goal as your coach is to help you find balance with your eating, workouts and life so that you aren’t constantly trying to juggle your schedule around a workout program or making program changes to fit your experience level, equipment and goals. I also want to change your relationship with food so that you aren’t worrying about what to eat at holiday events, sitting things out, or ready to run into the arms of the latest diet at the top of the New Year. Let’s take the guesswork out for you. “I am really feeling good about my eating for the first time in my adult life! Thank you so much for helping me get control in that area! I never thought it was possible to eat pizza, drink wine, and still find balance and lose weight. I was always in an all or nothing mentality. And in the all or nothing, I wasnt happy on either side of the spectrum. I’ve got a couple openings in my online coaching program and assessments are free. In the meantime, come on over to Facebook to join in the fun, ask a question, or tell me about your favorite double chocolate breakfast.